“Auf jeden Fall hat der Besuch allen dreien gefallen und sie bzgl. ihrer Ukrainisch-Kenntnisse weiter gebracht. Insbesondere die Lehrerin, die auch Christina hatte, konnte die Inhalte hervorragend vermitteln. „[…] thanks for the words of the teacher Oleksandra. I enjoyed the lessons. They were usefull for my begging in Ukrainian and I like very much the way that Oleksandra was teaching me. 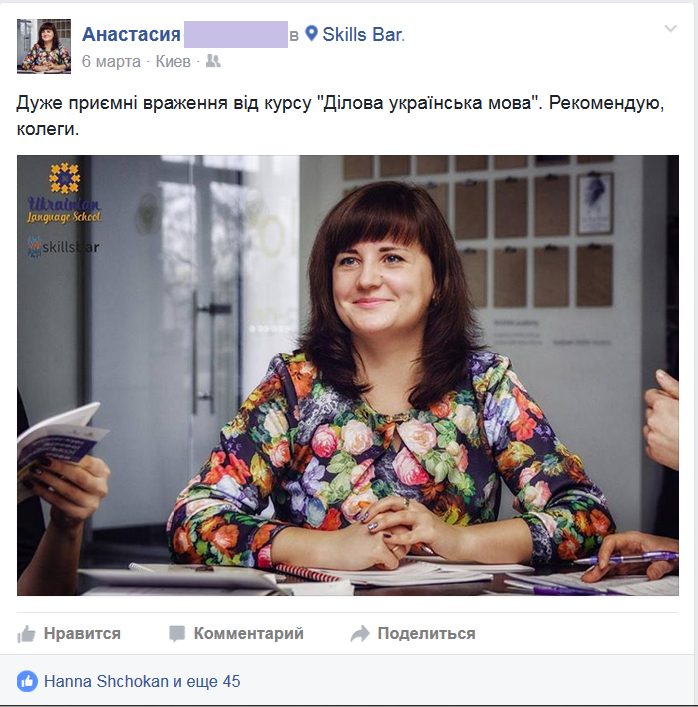 Рідко коли пишу відгуки, але нарешті зібралася:) Хочу подякувати Ukrainian Language School за чудовий проект та гарну роботу. Найбільший плюс - ваше ставлення до клієнтів. Відчувається доброзичлива атмосфера! Завдяки вам не тільки згадала шкільну програму, але вивчила багато нового, бізнес-курс – чудова ідея. З побажань: хотілося б пройти ще один бізнес-курс з більшою кількістю занять з викладачем. Дякую. Дякуємо за позитивний відгук, під час наступного курсу розглянемо Ваше побажання. I very much enjoyed the two-week intensive course I took with the Ukrainian language school. The atmosphere is friendly and the teachers have an enthusiasm for their language and culture, which they bring to the lessons. The lessons are very much tailored to the interests of students and I found that after the course my Ukrainian had considerably improved. Overall, I enjoyed the course, and really appreciated that you adapted the course content to my interests. I realise that it’s difficult to find materials to teach Ukrainian, so I’m grateful for the time and effort that you put into finding interesting articles, news reports and films. The one slight downside (and I’m saying this to help, not to criticise) was that due to the lack of existing materials, sometimes the lessons were just conversation practice (which is admittedly very useful in itself). I can see that you are aware of the current methodologies on language learning, and it’s true that there were opportunities during the course to build vocabulary and grammar in a structured way using the set texts of the lessons, but in an ideal world, there would have been more vocabulary/grammar building practice. What I mean by this is that it would have been good if the texts, videos and audio material aligned slightly more closely with the vocabulary building and grammar lessons – for example, after reading a text, there would be exercises. Admittedly, there were some for vocabulary, but there was nothing for grammar – grammar was often taught by looking at tables, which goes against most current thinking on how to teach grammar. I completely realise that creating these materials takes time and that you are a new school. And overall I wish you guys the best of luck in developing your school’s curriculum. I very much enjoyed learning with you and any criticisms are meant to help and not complain.